A story about falling in love and falling apart. After falling into a K-hole, a man is taken on a strange journey. Grim has just died. He's thrown into purgatory and suffers from amnesia as he tries to understand his standing in a post-apocalyptic world. He's guided by his guardian angel Neon while also being haunted by Bones... who is trying to collect his mortal soul. To top it all off, Instagram won't refresh. This is Last Teenagers of the Apocalypse. 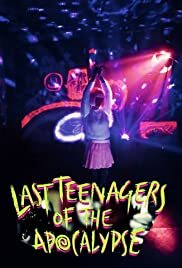 A gifted cast of young actors and a darkly outlook make the charming David lynch-Gregg Araki like, "Last Teenagers Of the Apocalypse" anything but sour. Jogia explores the disconnect people have today with other humans and the complete obsession with social media and digital space. The first two parts of the short film follows Grim,Landon Liboiron (Hemlock Grove) who just died and is in a purgatory state. It's the end of the world and "Instagram won't refresh". There are very few people left after the apocalypse, but luckily Grim has Neon (Scream's Carlson Young) who may be his ex-lover, but he doesn't remember. No one can: time, his previous life, or why Bones the Reaper Man (Jogia) is after him about a painting. "Last Teenagers of the Apocalypse" is deeply dark and disturbing, but charming in its way. The strength of Jogia's work is the big metaphor of our world. We live in a society where we've become so numb to the basic interaction of mankind that we probably wouldn't know what to do with ourselves if Instagram actually didn't refresh. What Jogia does in this project is challenge the viewers to think about the way we are living our lives.